(Captain Marvel I#20) - Heavily armed the half dozen members of the Rat Pack, led by Number One, looted a small town in the Nevada dessert after it was hit by a tornado. Number One urged them to act swiftly because they only had around thirty minutes until the National Guard showed up. They stole money, jewelry, radium and medical supplies. Number One was sure they would be paid plenty for the latter. By chance Captain Marvel arrived on the scene to help and knocked all but Number One and one other Rat Pack member out. Number One wasn't scared of him and shot at Captain Marvel, who tossed the unconscious Rat Pack members at Number One and his remaining ally to knock them out as well. 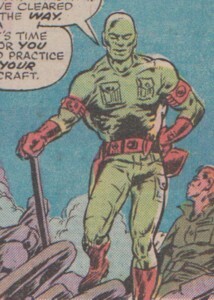 Captain Marvel left soon after the Red Cross and Army arrived on the scene. (Marvel Chillers#3 (fb) - BTS) - Joshua Plague took control over the Rat Pack from Number One. (Marvel Chillers#3 (fb) - BTS) - Joshua Plague led the Rat Pack on raids of disaster areas in several dozen nations across the globe, making the Rat Pack a target for many local authorities. (Marvel Chillers#3) - Flying in on their hovercrafts the Rat Pack attacked the U.S. Army Research Center in the Southern Californian city Kepkeville and broke in after taking down two local police officers to steal interesting serums Plague had learned about from his spy Number Six. The theft went as planned and the Rat Pack escaped the serums moments before reinforcements of the local authorities could catch them. They left behind one dead and one injured police officer. (Marvel Chillers#3 - BTS) - In search for the mystical Soul Catcher statue the Rat Pack attacked an Indian reservation near Kepkeville. (Marvel Chillers#3) - Number One shot down a police helicopter at the reservation, which also carried Tigra, who survived by jumping off before early. Tigra attacked Number One for the murder of the policemen, but Number Two, Three and Four came to his aid. She was ultimately overpowered by Plague through hypnosis. The Rat Pack left her behind alive and left with the Soul Catcher statue they had come for. Nobody at the reservation had survived the Rat Pack's attack. (Marvel Chillers#5 (fb) - BTS) - Fearing Tigra was not working alone Plague planned to abandon the mountain outpost and ordered Number Three and Four to plant explosive charges at the outpost. (Marvel Chillers#5) - Number One and Two returned to the desert to take out Tigra, but after a brutal fight with them, she was knocked out by Number Five with a crowbar from behind. Number Five criticized the other two for engaging the enemy without Plague's approval while Number One reminded Five that he was still talking to the second-in-command of the Rat Pack. 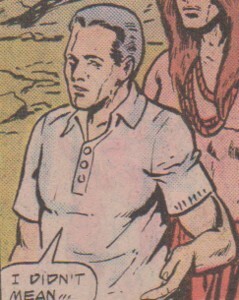 The trio returned to their hidden mountain outpost with Tigra. Plague was holding the Soul Catcher statue in his hands at the base. Number One confronted Plague about Five being out of line, but Plague told One that Five was just following his orders. One reminded Plague that they needed to follow chain of command and that it was One that formed the Rat Pack. Plague remembered and appreciated One's military skills, but then revealed that he had already ordered Three and Four to plant explosives because the Rat Pack was going to abandon the outpost. Plague ordered One and Two to load the Kepkeville serums onto the underground sled and to leave Tigra behind and let her die in the outpost's explosion. Tigra, who had only played possum, attacked the Rat Pack, but was knocked out by Plague with an energy blast from the Soul Catcher. Numbers Three and Four chained Tigra to a wall before the whole Rat Pack left the outpost. (Marvel Chillers#6) - Number One and the rest of the Rat Pack confronted Joshua Plague with Number Five at his side. One wanted some answers and started by asking why he insisted on everyone else wearing masks, why they were not allowed to meet Number Six yet and why they were stealing astromechanical serums. Plague knocked them all down with energy blasts from the Soul Catcher and reminded them how he saved each of them. Tigra and Red Wolf arrived at the outpost on another underground sled from the previous outpost and attacked Plague and Number Five. While Red Wolf and Lobo fought Number Five stumbled into an exposed wire and was revealed to be a robot. Tigra resisted Plague's hypnotic powers and he was forced to reveal that he was the Super-Skrull. The other members of the Rat Pack were shocked by both revelations. (Marvel Chillers#7) - While the rest of the Rat Pack watched Five and the Super-Skrull kept fighting Tigra and Red Wolf. Number One, Two, Three and Five decided to flee because it didn't matter who won to them because they would either end up dead if the Super-Skrull won or in prison if the heroes won. When Lobo stole the Soul Catcher the Super-Skrull followed him and gave Tigra a chance to aid Red Wolf against Five, whom she ripped apart. The fight was watched by Bannion. Ultimately the Super-Skrull was defeated when he was drawn into the Soul Catcher while trying to steal Tigra's soul with it. (Thunderbolts I#4 (fb), 33(fb) ) - Following the Onslaught disaster, during which armies of Sentinels laid waste to New York City, the mad geneticist Arnim Zola hired the Rat Pack to scour the ruins of New York to find people he could use in his experiments. Helen "Hallie" Takahama helped defend other survivors of the carnage, but they found themselves being hunted by the Rat Pack. (Thunderbolts I#1) - One of the Rat Pack members located Hallie as she considered revealing herself to a news crew. He knocked her out with chrloroform, and brought her back to the others, to be transported back to Zola. The Rat Pack members tried to gun the heroes down with their guns and rocket launchers, but failed, and most were taken down by the heroes. Number One himself tried to escape, but was stopped by Citizen V. Suddenly he cried out "Rat Pack -- Mousehole", and jumped down in a hole. The rest of the Rat Pack members also ran for the tunnels, and before the Thunderbolts could follow them, the tunnels exploded, making the entrance collapse, and thus it was impossible for the Thunderbotls to follow them. Later when the Thunderbolts held their first press-conference, one of the reporters present told them that the Rat Pack had been sighted several blocks away from where they last fought them, and the Thunderbolts decided to set after them. When the Thunderbolts arrived at the place where the Rat Pack had been seen, they found the Rat Pack garbed in rocket packs, and they immediately jetted away, to lead the Thunderbolts out to the Statue of Liberty, where the Wrecking Crew were waiting to defeat the Thunderbolt (see comments). Although the Rat Pack succeeded in baiting the Thunderbolts and escaping themselves, the Wrecking Crew were defeated. Comments: Created by Roy Thomas (writer), Gil Kane (pencils), Dan Adkins (inks). I am pretty sure Bannion, who was working with the tribe before knew about the Soul Catcher and was the reason why Plague knew about it as well. He was just playing dumb in front of Red Wolf to keep his evil deeds a secret. When last seen the Rat Pack didn't seem to have a female member, which was reason for me to include Number Two in the former members section. Three and Four could still be with them and One was very likely the same guy as in Captain Marvel I#20 and the storyline in Marvel Chillers. Although the Thunderbolts eventually brought Zola to justice in Thunderbolts I#4, the Rat Pack apparently skipped town. It can be presumed that all members receive a numbered designation within the Rat Pack. What is uncertain is if the number of former members is redistributed or retired along with their departure. It is also possible that the Rat Pack works with a promotion demotion system giving even Number Fourteen the chance to become Number Two at some point. According to Busiek the Rat Pack from Thunderbolts were intended to be the current incarnation of the group in Captain Marvel I#20, having changed over time but they were still the same organization. Busiek loves characters with a very specific niche and liked the Rat Pack because they were scavengers for hire (not saboteurs), which he considered a great idea. They go to disaster areas and loot the wreckage. Asked by Norvo Busiek also remembered setting up a story point he never got to pay off. Zemo hired both the Rat Pack and the Wrecking Crew in Thunderbolts I#1 to make sure the T-Bolts could make as big and splashy a debut as possible. That explains the stray line of dialogue from Number One: "We're being paid a bonus for this Pack, so make it look good" when for no particular reason they led the team to Liberty Island where the Wrecking Crew conveniently happened to be waiting. Or as Kurt put it: "We never got around to revealing it, but Zemo arranged things." Captain Marvel and Marvel Chillers appearances added by Markus Raymond. Profile by The Beetle Expansion by Markus Raymond. Number One is the unidentified leader of the Rat Pack. (Marvel Chillers#5 (fb) - BTS) - Number One has a military background. (Captain Marvel I#20 (fb) - BTS) - At some point Number One founded the Rat Pack. (Captain Marvel I#20) - Number One led the Rat Pack in scavenging money, jewelry, radium and medical supplies from a town near the Nevada Desert, which had been hit by a tornado. After explaining the urgency because the National Guard would arrive in half and hour Nuber One oversaw the looting and hoped they would be paid plenty for returning the medical supplies and radium. They were stopped by Captain Marvel, who knocked out Number One last by tossing a few unconsious Rat Packers at him before Number One could shoot at Captain Marvel. (Marvel Chillers#3 (fb) - BTS) - Joshua Plague took command from Number One over the the Rat Pack. (Marvel Chillers#6 (fb) - BTS) - He made everyone but himself wear masks including Number One, who wasn't wearing a mask before. (Marvel Chillers#3) - Slightly annoyed by Plague shouting commands at him Number One gassed the people in Kepkeville with knockout gas and then joined the break-in at the US Army Reserach Center to steal several interesting serums. Number One was criticized Number Two, their sole female member, for trying to play them off against each other when she was flirting with Number 4 after flriting with his brother Number 3 the previous week. The theft of the serums went as planned and Number One fled the scene in his hovercraft vehicle like the rest of the Rat Pack before the local police could catch them. (Marvel Chillers#3 - BTS) - Number One participated in an attack on the reservation near Kepkeville in search for the mystical Soul Catcher statue. (Marvel Chillers#3) - When a police helicopter arrived at the reservation Number One warned the others and shot it down with a rocket launcher, killing the policemen. 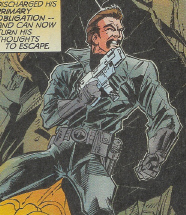 He was then attacked by Tigra, who had jumped off the helicopter moments earlier. Tigra tossed him around with ease, but Number Two, Three and Four came to his aid and ultimately Tigra was knocked out by their leader Joshua Plague, who ordered the Rat Pack to just leave her behind. Number One didn't like it to leave Tigra behind alive. (Marvel Chillers#5) - Without Plague's approval Number One returned to the desert to kill Tigra. He was joined by Number Two, whose female wiles One promised would not work on him. After Two took a shot at Tigra Number One used knockout gas on Tigra, but she held her breath when she smelled the first trace of gas and fought back. Number Five knocked Tigra out from behind and criticized Number One for going after Tigra without Plague's permission. One reminded Five that he was still second-in-command. Upon returning to their secret mountain outpost with Tigra, who was playing possum, One confronted Plague about Five questioning him. Plague told One that Five was only following his orders, but One wanted Five to follow the chain of command and respect him as superior and reminded Plague that it was One who originally founded the Rat Pack. Plague reminded One that the Rat Pack was nothing without him and that he only kept One around because his military skills were useful up to a point. Plague ordered One and Two to load the Kepkeville serums and anything else practical onto the underground sleds. Tigra stopped playing possum and assaulted the trio until Plague knocked her out with an energy blast from the Soul Catcher. Number One fled the outpost along with the rest of the Rat Pack. (Marvel Chillers#6) - Number One with most members behind him confronted Plague with Five at his side. He wanted answers for the need to wear masks, the secret identity of Six and the theft of astromechanical serums, but instead of answers he received an energy blast from the Soul Catcher from Plague and a lecture on how he had saved them all. 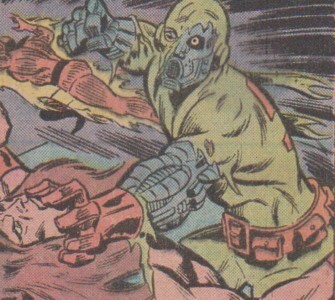 One was shocked when Five was revealed as a robot and Plague as the Super-Skrull during their fight against Tigra and Red Wolf. (Marvel Chillers#7) - Number One and the rest of the Rat Pack watched Five and Plague fight Tigra and Red Wolf. One realized that either side winning would be trouble for them and Two suggested to flee, which they did. 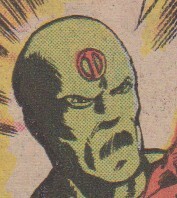 (Thunderbolts I#1) - Number One was hired by Arnim Zola to retrieve survivors from the ruins of New York City after the Sentinels attack for Zola to use in his experiments. Number One demonstrated sound leadership skills and combat strategy, and saw to it that none of his men were apprehended by the Thunderbolts. (Marvel Chillers#5 (fb) - BTS) - At some point Marie was known as Madame Menace, the Crime Queen of New Orleans. (Marvel Chillers#6 (fb) - BTS) - When the Maggia overthrew her reign in New Orleans Marie was saved from them by Joshua Plague. (Marvel Chillers#3 (fb) - BTS) - Number Two, the sole female member of the Rat Pack, tried to play the other members off against each other for some time. The week before the Rat Pack's attack on Kepkeville she was flirting with Number Three. (Marvel Chillers#3) - Number Two participated in the Rat Pack's attack on Kepkeville and its US Army Research Center. She knocked out a local police officer with a kick after Number Three killed the other officer with a knife to the back. During the break-in to the reserach center Number Two flirted with Number Four, the brother of Number Three. She boarded a hovercroft with Number Three and Four to escape the local authorities after the successful theft of several interesting serums. (Marvel Chillers#3 - BTS) - In search for the mystical Soul Catcher statue Number Two participated in an attack on the nearby Indian reservation. (Marvel Chillers#3) - Number Two came to Number One's aid when he was attacked by the heroine Tigra. Though she kicked her in the head she talked too much during her assault and got knocked into a tree with a double kick to the stomach. After Plague defeated Tigra Number Two helped Number Three to take his injured brother Number Four to safety. On Plague's order they left Tigra behind alive. (Marvel Chillers#5) - Number Two joined Number One when he returned to the desert to finish off Tigra without Plague's permission to do so. Jumping from their hovercraft Two attacked Tigra with her martial arts skills, but got her mask ripped off. Revealing her true identity Two kept fighting until Tigra ripped through her costume with her claws. She got mad at One when he seemingly knocked Tigra out with knockout gas, but Tigra had held her breath and took him out with ease. Before Two could continue her fight with Tigra the heroine was knocked out with a crowbar by Number Five, who criticized their actions. Number Two returned with the others with Tigra, who was playing possum, to the Rat Pack's hidden mountain outpost. 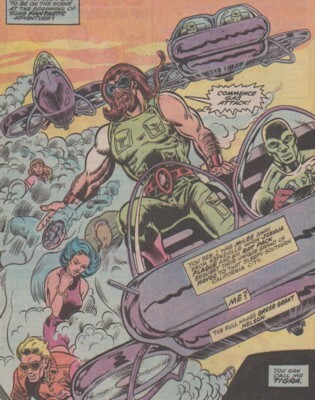 At the base Two listened to an argument between One and Plague until Plague revealed that he had ordered Four and Five to plant explosives to blow up the outpost because they would abandon it in case Tigra had not been alone. Plague then ordered One and Two to load the Kepkeville serums and everything else useful on the underground sled. Tigra stopped playing possum and attacked the trio until Plague knocked her out with an energy blast from the Soul Catcher. Two was surprised at Plague's new powers, all the strange thefts and that Plague knew who Tigra was and told Four about it. She later fled the outpost along with the rest of the Rat Pack. (Marvel Chillers#6) - Two stood behind One with most members of the Rat Pack when One confronted Joshua Plague. She got knocked out by Plague with an energy blast from the Soul Catcher and reminded how Plague had saved her before. 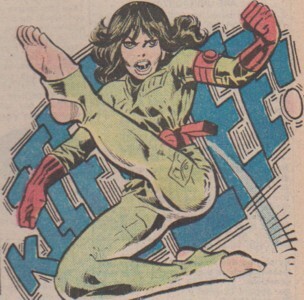 She was shocked when Five was revealed to be a robot and Plague to be the Super-Skrull during a fight with Tigra and Red Wolf. (Marvel Chillers#7) - Two kept watched the fight between Plague and Five on one side and Tigra and Red Wolf on the other. Realizing either side winning was bad for the rest of the Rat Pack Two suggested to flee the scene, which the Rat Pack did. (Marvel Chillers#6 (fb) - BTS) - Three and Four were criminals on death row when Joshua Plague apparently broke them out of prison. (Marvel Chillers#3 (fb) - BTS) - The week before the Kepkeville attack Number Two flirted with Number Three. 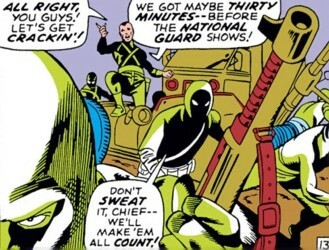 (Marvel Chillers#3) - The brothers Number Two and Number Three participated in the Rat Pack's attack on Kepkeville and its US Military Research Center. When a police officer tried to call for reinforcements Number Three killed him with a knife to the back. Number Two criticized him for the murder after knocking out another police officer, but Three told her that at least his target wouldn't get up to get them in trouble again. A short time later Number Four used plastic explosives to blow up the research center's vault door. After the successful theft the brothers and Number Two escaped in a hovercraft before the local authorities could apprehend them. (Marvel Chillers#3 - BTS) - The brothers participated in an attack on a nearby reservation in search for the mystical Soul Catcher statue. (Marvel Chillers#3) - Number Three and Four came to Number One and Two's aid when Tigra attacked them. 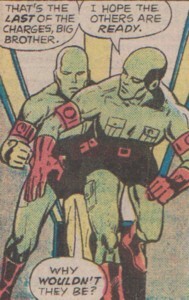 During the fight Number Three accidentally injured his brother with a knife through the shoulder and threatened to kill Tigra for making him injure his brother. Ultimately Plague knocked Tigra out and ordered the Rat Pack to leave her behind alive. Number Three and Two helped the injured Number Four to safety. (Marvel Chillers#5 (fb) - BTS) - The brothers were ordered by Joshua Plague to plant explosives at the hidden mountain outpost after the attack by Tigra at the reservation because he feared Tigra was not working alone. (Marvel Chillers#5) - The brothers planted explosive charges at the outpost and returned to the others when they were finished. They were surprised to find Tigra fighting One, Two and Plague. Tigra tossed One and Two at the brothers to knock them down before Plague knocked her out with an energy blast from the Soul Catcher. Afterward Two talked with Four how strange everything had become. 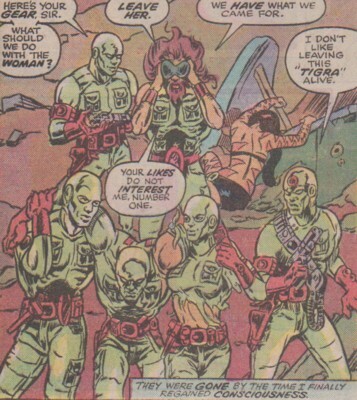 The brothers chained Tigra to a wall and then left the outpost with the rest of the team. (Marvel Chillers#6) - Three and Four stood behind One when he confronted Joshua Plague, but got knocked out with an energy blast from the Soul Catcher by Plague, who reminded them how he had saved them. (Marvel Chillers#7) - Three and Four kept watching the fight between Plague and Five on one side and Tigra and Red Wolf on the other. Realizing the Super-Skrull wouldn't need them after abandoning his diguise one of the brothers was sure he would kill them. Two suggested to flee the scene, which the Rat Pack did. (Marvel Chillers#6 (fb) - BTS) - Joshua Plagua aka the Super-Skrull used a preprogrammed robot as Number Five of the Rat Pack to serve as his loyal henchman. 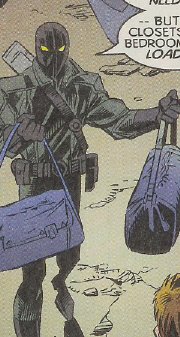 (Marvel Chillers#3) - Number Five participated in the Rat Pack's attack on Kepkeville and its US Army Research Center. Serving as Joshua Plague's pilot he tried to reassure Plague when Number One criticized Plague for shouting orders at him, but Plague didn't care as long as Number One didn't make any mistakes. Number Five cleared the way by knocking out the soldiers with a crowbar during the break-in. After the successful theft of several serums Number Five escaped the local authorities in a hovercraft. (Marvel Chillers#3 - BTS) - Number Five participated in an attack at a nearby reservation in search for the mystical Soul Catcher statue. (Marvel Chillers#3) - Five was at Plague's side when Plague came to the aid of the rest of the Rat Pack against Tigra. After Plague defeated Tigra Number Five returned Plague's gear to him. (Marvel Chillers#5) - Five came to the aid of One and Two in the desert when they were fighting Tigra and knocked the heroine out with a crowbar. He criticized them for going after Tigra without Plague's approval, which angered One, who reminded Five that he was still his superior. Five told him that he respected Plague and that One was spending too much time to become leader again which would never happen as long as Plague was alive. Five carried Tigra, who was playing possum, back the hidden mountain outpost where One confronted Plague about Five's actions. 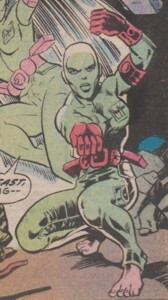 Plague revealed that Five was only following Plague's orders and then ordered to abandon the outpost and leave Tigra behind to die in the outpost's explosion. Tigra stopped playing possum and tossed Five through a wall. After Plague knocked out Tigra with an energy blast from the Soul Catcher Five fled the base with the rest of the Rat Pack. (Marvel Chillers#6) - Five stood with Plague when the latter was confronted by Number One and the rest of the Rat Pack. He watched as Plague knocked the ungrateful humans out with an energy blast from the Soul Catcher. When Tigra and Red Wolf attacked Five took the fight to Red Wolf and tried to electrocute him on an exposed wire. Lobo distracted Five long enough for Red Wolf to strike at Five, who stumbled into the wire. The electricity destroyed parts of his costume and exposed Five as a robot to the shock of the rest of the Rat Pack. (Marvel Chillers#7) - Five kept fighting Red Wolf and overpowered him with his pure robotic strength. When Lobo stole the Soul Catcher statue the Super-Skrull followed him to retrieve it giving Tigra the chance to aid Red Wolf against the robot, which Tigra ripped apart in the process. 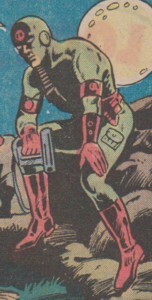 Five's upper body crawled to the outpost's self-destruct button and pushed it moments after Red Wolf and Tigra had escaped, blowing himself and outpost up in the process. (Marvel Chillers#3 (fb) - BTS) - Bannion stumbled across the existence of the Cat People during college and has helped them ever since. He became close friends (or more) with Dr. Tumolo. At some point he became a legal consultant. (Marvel Chillers#5 (fb) - BTS) - Bannion sometimes served as legal consultant to the Indians at the reservation near Kepkeville. (Marvel Chillers#3 (fb) - BTS) - Secretly working as the Rat Pack's Number Six Bannion provided Joshua Plague with intelligence on several occasions. Number Six told Plague about interesting serums at the Kepkeville US Army Research Center. (Marvel Chillers#3) - Tigra and Dr. Joanne Tumolo met with Bannion at his apartment. After greeting them Bannion told them that Professor Leon of the Cat People had been exposed during the Rat Pack's raid on the research center and was imprisoned because the police believed him to be a member of the Rat Pack. (Marvel Chillers#6) - Bannion was present while Tumolo and Leon were working on a serum to enable Tigra to return to human form if she wanted to. They talked about the Rat Pack before Bannion left for a secret meeting with Joshua Plague. (Marvel Chillers#7 (fb) - BTS) - Bannion met Red Wolf with the Soul Catcher outside the Rat Pack secret outpost followed by the Super-Skrull, who he didn't know was Joshua Plague. (Marvel Chillers#7) - Inside the Rat Pack's outpost Bannion watched Tigra and Red Wolf leaving from the shadows and decided to leave himself. He was glad they didn't see him or else they could suspect him to be Plague's spy. Bannion wondered what had happened to Plague. Number Fourteen was one of the Rat Pack members used in the hunt for survivors in New York City. He went out looking for valuables for the Rat Pack themselves while the rest of his teammates hunted for survivors. He came back with a load of furs, jewelry, and rare coins. He also noticed a man with gold teeth in his mouth and suggested going back for them, an idea Number One supported.